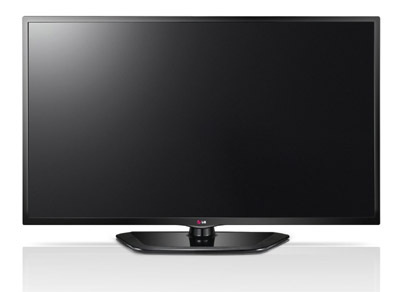 The 55LN5700 is really similar to the LA6200 series from LG in most respects except that it does not have 3D compatibility. This is the primary difference that and that it will cost less as a result. The Magic Remote from LG which we like a lot is an optional accessory with the 55LN5700 and is likely worth it if you plan to do a lot of web browsing and Smart TV Apps using. It has a new voice control function this year as well which enables simple functions to be performed by voice. The greatest attributes of the 55LN5700 is its value proposition. Since it eschews many fancy features but still has a great picture and web function, it saves you money while offering a lot in return. Overall picture quality from the LG LN5700 runs above the middle grade Vizio TVs. Colors are very true and calibration accurate on this TV. The front panel of the TV is not as clear coat as the LN6200 series above and thus has more glare from in room light due to a more matte-screen finish. This also causes less picture depth and a poorer performance from off angle viewing. These are specs you pay for in higher end TVs with more picture technology. LG omits passive 3D in the LN5700 line to help contain the cost, but I feel you still get some relatively good picture performance out of this TV, especially in a controlled light environment. This LED direct-lit LCD television has good off angle viewing performance for an value LED TV. Compared to many LED direct lit models the 55LN5700 still looks good at angles around 30 degrees off center where the other will start to have the contrast degrade at 20 to 25 degrees. This is not a strength of the TV as plasma TVs are still much better in this area but it has gotten much better. Vivid – Total blow out of colors with lots of artificial image edges, everything fake overblown. Standard – 100% backlight with 100 contrast setting. Eco - has backlight set at 70% with contrast at 100. Not a favorite. Game Mode – specifically for gaming supposed to help reduce motion lag but it was still noticeable. This setting turns off the TruMotion feature and is best for gaming from our tests (even though there are still many drawbacks). In addition to the above gaming benefits the LN5700 also has 120Hz native refresh which will also help to reduce judder and motion blur. To go along with the Smart TV function, you also get 120Hz native refresh rate panel, along with built in Wifi and a built-in Web Browser. And although the LN5700 does not have the top end looks, it's nevertheless attractive and some may prefer it to the somewhat showy Cinema Screen TVs from LG with the Magic Stand and .4mm frame. It also has a dual core processor. The Home Dashboard feature is back again in 2013. 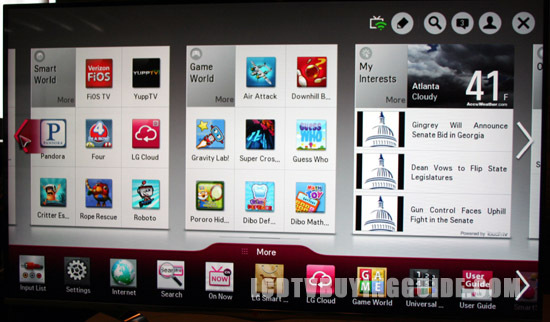 It enables the TV to remember and list all the various Apps you have downloaded and viewed on one convenient page. There is also a dedicated button on the remote to access it quickly. LG has made changes to the dashboard for this year to make it easier to place your favorite programming on the first page. When click on the Home option on the remote, displays a very thorough menu of options for Internet use, quick selections for some of the premium Apps as well as a selection for just the Internet itself. This year LG has increased the CPU speed by 120% to enable faster toggling and loading of programs which is good because we found it slow last year. The gaming crowd will enjoy knowing that the graphics processor (GPU) on this TV is 300% faster than last years model, and it has a Dual Core processor so totally suitable for gaming. We did note input lag when testing games on the LN5700 even with these upgrades. In the 55LN5700 the remote standard, thin, rectangle. The Magic Remote is optional and comes with voice command function this year and should cost you around $120 as an accessory. I especially like this remote control because it speeds browsing and Smart TV function a lot with it's simple hand gesture point and click technique. Consider the option if it's not too expensive and if you plan to do a lot of browsing on the TV. Amazon has the Magic Remote for sale here at a good price. Clear Voice II and Virtual Surround Plus options here add interesting choices, but our choice is the Cinema setting with Clear Voice II setting enabled with the level set at 3. The Standard setting is our second favorite with Clear voice II enabled. Overall we rate the sound quality of this TV as excellent and a high point and it will be especially useful on a TV of this size, for which you likely will not have a home theater system. It is better than the other manufacturers we've tested as well by a long shot. The speaker in the bottom back of the TV adds most of the overall depth to the TV but we believe it is well worth it to have good sound from the TV. These minimalist TV designs are often used in spaces without home theater systems. The half inch bezel frame in black gloss is nice looking. The stand is a little cheap looking and not the heaviest plastic material. The depth of 3.17” is not super thin by any means but it does not prevent you from wall-mounting either and accommodates the better speakers. The 55 inch 55LN5700 tops out the largest size in the LN5700 series and is a great value piece if you want that great LED direct lit backlighting from LG and tons of features sans 3D at a $1100 price point. There is heavy competition in the 55 inch size and thus pricing competition. 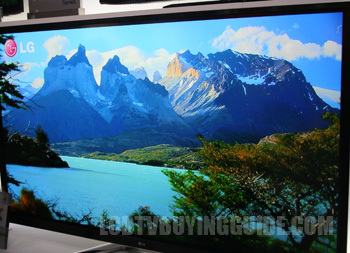 Some good competitors are the Samsung UN55F6300, the Vizio M551d as well as the Panasonic TC-P55S60 plasma. TV without stand (WxHxD): 49.17" x 28.54" x 3.11"
TV with stand (WxHxD): 49.17"x 31.14"x11.69"